Fig. 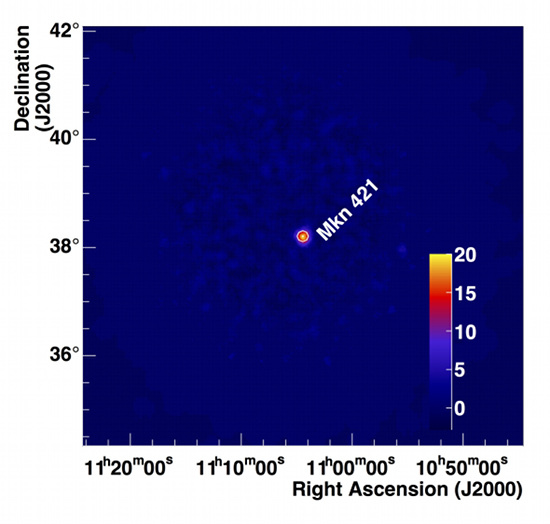 1: Gamma-ray sky image of Markarian 421 as seen with the new H.E.S.S. cameras. When H.E.S.S. explores the mysteries of the high-energy sky, it actually does not look into the Universe, but at the upper Atmosphere. 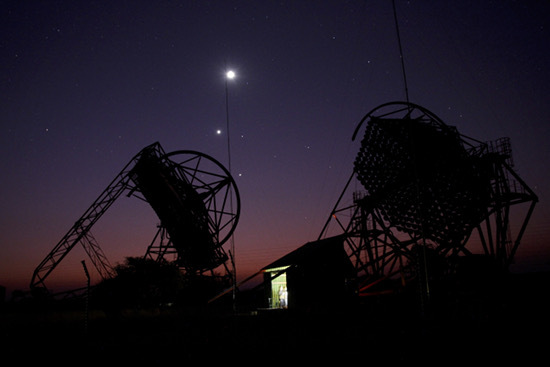 Cosmic gamma-rays are absorbed there and produce short, faint, violet Cherenkov light flashes that can be detected from the ground. It requires large mirrors and ultra-fast electronics to record and digitise them to images that actually display the gamma-ray incidence. The exposure times per image are as short as 16 nanoseconds (16/1,000,000,000 of a second), and H.E.S.S. is recording about 300 particle incidences per second. Since some images only consist of a few handfuls of light particles (photons), the technical requirements to build such cameras are very challenging. But the ten years for which the original H.E.S.S. I cameras have been operated have not only degraded their physical condition; also the available technologies have developed much further. The internet has accelerated the development of fast ethernet solutions. Electronic chips and CPUs have become smaller, faster and capable of doing more complex tasks. Software has become smarter and faster to develop in an industrial and standard way. 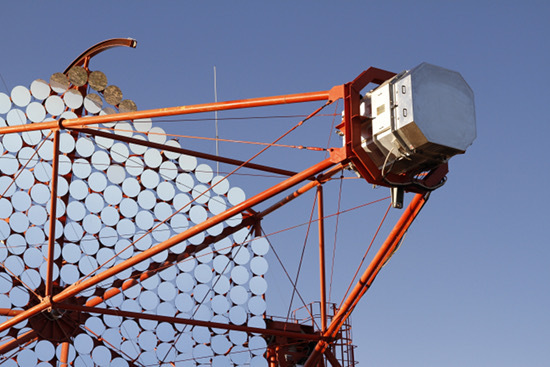 Following these improvements, scientists have started designing prototypes for the next generation of gamma-ray observatories. An important technological driver of the next big experiment in the field, the Cherenkov telescope array (CTA), is the NECTAr readout chip. It can capture the fast signals in Cherenkov cameras an digitise them nanosecond by nanosecond when requested by the trigger. Fig 2: Microphotography of the NECTAr chip. © CEA/Irfu, Eric Delagnes. 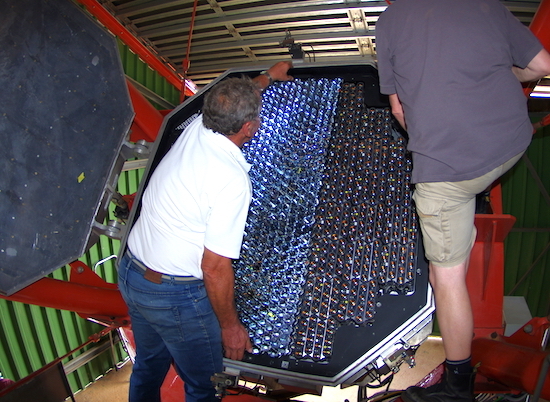 Fig 3: Assembly of a new front-end unit in Namibia, displaying the photomultiplier tubes, high voltage bases and new electronics boards with NECTAr readout chips (right to left). © DESY, Stefan Klepser. But in fact, this is only one of the first-time-ever features of the project. Because also the project host DESY was relatively new to the field and had never built a camera for Cherenkov telescopes like H.E.S.S. before. Still, the engineers, physicists and technicians lost no time, and with a lot of support from the partnering institutes in the Paris area (LPNHE, LLR, IRFU), Universities of Leicester and Amsterdam, MPIK in Heidelberg and of course endless support by the local MPIK team in Namibia, the cameras were developed, tested and installed in the short time frame of only 4 years. The plan foresaw a replacement of all electronics except the costly photosensors, plus some mechanical components, like installing a new backdoor to improve the ventilation in the camera. Fig 4: Installation of one of the new ventilation systems. The camera resided in the "camera shelter" while all new mechanics components are installed. © DESY, Stefan Klepser. On top of this, colleagues from LLR added a full renewal of the light collimators in front of the PMT pixels ("Winston cones") to the list of things to improve, so more light is collected in the first place. Fig 4a:Installation of one of the cone plates, housing the new Winston cones, on the front side of the camera. This does not mean, of course, that there was no room for failure and funny stories. A deep and gruesome crisis had to be endured to understand that the new cameras did not harmonise well with the monkey repelling electric fence that is installed around the H.E.S.S. array (really, who thinks of that when you're contemplating the detection of cosmic accelerators?). And big was the adrenaline turnover when the mechanics learnt that they had designed their first components for a camera that is one centimetre smaller than they had anticipated. Well, H.E.S.S. is an experiment, and we like that. At some point, everything was assembled and working, and the cameras could take off. Fig 6: Series of stereoscopic images of candidate gamma-ray events as seen with then new H.E.S.S. cameras. Images of particle incidences could be recorded smoothly, and the source could be detected. The new cameras, which are 4 of only 12 currently operating Cherenkov cameras, seem to work. 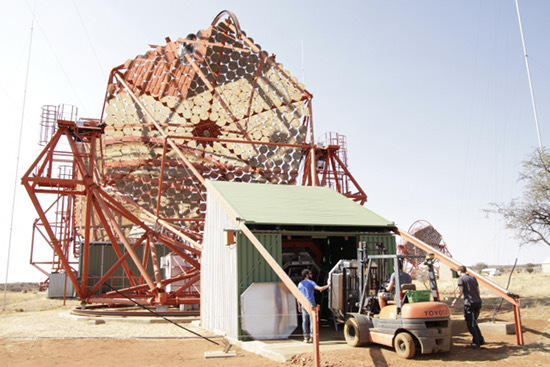 They deliver the first large scale demonstration that 3840 NECTAr chips are able to record gamma-ray signals that are good for Teraelectronvolt astronomy. And they make us look forward to the final years of H.E.S.S., where the new cameras, with their much reduced dead time, and more flexible readout, will provide us with enhanced performance at both very low and very high energies.